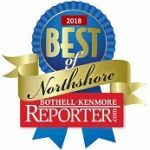 The Bothell Kenmore Chamber was voted by our Northshore Community as the “Best Organization To Be A Member Of” in the 2018 Best of Northshore Awards! Benefits included in your membership. Your business receives a customizable listing page on our website’s Business Directory visited by thousands annually seeking local goods and services. The Chamber gives priority referral to our members when receiving inquiries about local products and services. Upon joining, your business along with a link to your website and a brief description, will be announced on four of our social media channels. The Chamber/Visitor Center is happy to share your brochure with our visitors seeking local resources. You will also have the opportunity to display your brochures on the Member Information Tables at our General Meeting and Luncheon events. Members have the benefit of gaining additional exposure for their upcoming events by adding them to our online Community Event Calendar viewed by thousands every year. Your event page is customizable and can include a video, logo, map link and more. As an added bonus your event will also appear in your business directory listing. New members are invited to give a 1-2 minute commercial speech at the next General Meeting event to share key features of your products and services. This event is typically attended by 65-100 people and is a great way to let others know about your business and who makes a great referral for you. The Chamber emails a newsletter twice a month and you can request your special announcement or upcoming event be considered for inclusion. We organize and host 30+ networking events every year to help our members make new connections, discover collaborative opportunities, and learn about new businesses. We have members to network with from 15 different cities. Most of our events are free to members, and we host them morning, noon and night to suit your style and schedule. We organize and manage five committees that meet almost monthly to help our members become more engaged with topics and activities of interest to you and your business. Members benefit from smaller group discussions and collaborations towards common goals. Come give back to your community, get better acquainted with other members, and network without the networking! Enjoy supporting your community while working alongside others at fun events. The Chamber is your connection to Legislative issues that affect your business and community. We are involved with organizing and hosting Candidates Forums, Legislative Send-Off Events, an annual Q&A Luncheon with local politicians and more to help you connect with civic leaders, stay informed of legislation, and add your voice to important issues. Do you have a new location or remodel to promote? Gain additional publicity for your business with a ribbon cutting ceremony performed by the Chamber. Gather in a quieter setting to meet prospective and new members as well as some of the Chamber staff and learn all about your Chamber benefits. Ask questions, make new friends and connections, and enjoy a delicious lunch on us. Discover All The Benefits Of Membership! Become A Chamber Member Today! For those businesses wanting a little more we offer our Members a variety of advertising and sponsorship opportunities to gain exposure, strengthen your community connections, and grow your business. Sponsorships start at only $100! With dozens of events every year we offer plenty of opportunities for you to find and event and sponsor level that suits your professional needs and budget. Our website is visited by thousands of residents, businesses, investors and visitors seeking local resources and events. Give your business maximum exposure by advertising on our website. We will soon be introducing video marketing opportunities at the Chamber office and Visitor Center. With hundreds of visitors a year, our new video marketing will enable you to gain additional exposure to tourists, new residents, other businesses and more! Auction Donations – the Chamber is always seeking donations in the form of products and services for our largest annual fundraiser, our Holiday Dinner & Auction event. Donors receive recognition on our website, at the event in front of your donation, and in a designated email. Door Prizes – members are welcome to donate a door prize to be given away at one of our General Meeting or Luncheon events. Donors of door prizes are permitted to make a 30 second speech to the room at the event. Help a student achieve a higher education by donating to the Chamber’s Scholarship Fund. Your business name will be recognized on our website and on our formal scholarship donors plaque at the Chamber office. A premier membership level offering maximum prominence, visibility and name recognition while creating awareness that your company is a greater supporter of the Chamber and the economic vitality of our community.